LOCAL MUSICIAN PLAYING FOR 33 YEARS! John Mazur is a local musician who has been providing musical entertainment for the residents of the Latrobe Valley over the last 33 years. John is a self-taught singer and guitarist who began playing the guitar when he was 15 years of age. John has never received any formal teaching regarding either singing or guitar playing. Instead, John taught himself by watching other guitarists and listening to the radio. John says that "I had to teach myself because there were no guitar teachers". John chose to learn how to play the guitar out of the other various instruments because the guitar was popular in the 1960's and because "the Beatles were a guitar based band". In fact, the Beatles, a famous quartet in the 1960's and 70's, provided the inspiration for John to decide to become a musician. John's passion to become a musician was fuelled by the popular music of the 1960's, which was heavily influenced by artists such as Jimi Hendrix and the Beatles. Although John had serious aspirations to become a musician in 1964, his dream was not realised until Christmas Eve 1966 when he played his first gig. John says "I was asked at short notice to fill in for the rhythm guitarist for the band The Mystics because the other guitarist was sick. It was a Christmas dance and the other band members and I got along so well they asked me to fill-in permanently for the regular rhythm guitarist". It was good timing. John had become slightly disillusioned in finding a band he wanted to be a part of and the members of The Mystics were so impressed by John's talent that they requested John to replace the other member. The teaming was successful because John was a member of The Mystics for 3 years. Not bad for a fill-in gig! After playing with The Mystics, John played with Noggins and Bats for 1 year; Stoned for 4 years, Pyramid for 13 years; 2 Amigos for 4 years and he has presently been a solo musician for 7 years. John experienced a lot of local success when he joined The Mystics, Noggins and Bats and Stoned and he puts this to "our ability to play the music young people wanted to hear". However, John's musical success dramatically increased when he formed the trio Pyramid with two friends: Keith Ingleton and Terry Couples. Terry was the bass guitarist, Keith was the drummer and John was the lead guitarist. All three shared the responsibilities of singing. Pyramid were a cabaret band and were usually booked for weddings, birthday parties, engagements and work break-ups. Pyramid also had a long standing relationship with a hotel owner in Lakes Entrance where the band members and their families would stay in the hotel every holiday while John, Terry and Keith would entertain the guests during the evenings. This arrangement lasted for 12 years and only ended because the hotel owner decided to move interstate. (Pyramid. 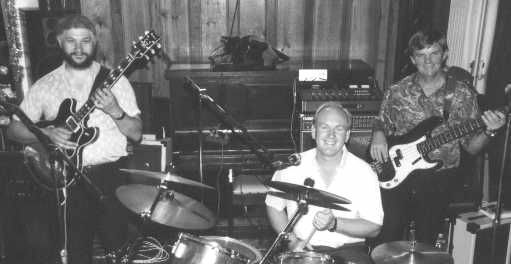 Left to right: John Mazur, Keith Ingleton and Terry Cupples, Lakes Entrance 1988). Terry says of the break-up of Pyramid "It was an amicable split. We had been together for 13 years and we ended as a band when we didn't play at Lakes Entrance any more". Keith says "Pyramid was based on mutual interests. When we began to go in different directions, so did the band". It was only when Pyramid disbanded that John began to experience the most local success of his life: as a solo musician. When John began his musical career, his long-term ambitions were simple: "to be involved in the local music industry". This ambition has been fulfilled over the past 33 years, but his ambitions have become more specific as John has enjoyed more local success. John now says of his aspirations "I want to continue playing music until it is physically impossible and to understand other forms of music". To enhance his ability to appreciate other forms of music, John has been self-teaching himself to play lap-steel style over the past 3 years. John uses every opportunity to practice and uses his busking time to hone his techniques. John says he busks because "it gives me the opportunity to present my original music, it's a form of artistic expression and it's a marketing tool - if people see what I have to offer musically, they may book me for an event". After John's experience with playing in bands, it is not surprising that he enjoys playing solo. The reasons behind this preference are because of its stability - John says "in a band it's always possible that certain members may quit. When you play solo, that possibility is alleviated". John can also quote a cheaper fee than bands because there is only one person to pay and also because John can be booked for smaller halls and reception areas than bands because he takes up less room than a band. John also enjoys the challenge of playing solo because he is responsible for everything. In a band the various members have certain responsibilities to fulfil, but playing solo means that it is John's responsibility to ensure that everything will run smoothly. John says that the majority of gigs he is booked for are "usually service clubs and pubs, with the occasional private party or business function". The opportunity for john to play his own music at these functions is rare because the people want to hear and dance to songs that they recognise. John says he enjoys playing his own songs and those written by other artists equally because it depends on the situation. For example, John can play his own songs when he is busking and songs by other artists when he is at a gig - it's of no preference because he is interested in providing the public and his listeners with what they want to hear. John says that when he does play other artists' music, the songs he enjoys playing the most are: I Think It'll Work Out Fine by Ry Cooder; I Saw Her Standing There by the Beatles; Redhouse by Jimi Hendrix and Now That We've Ended As Lovers by Jeff Beck. John says of these songs "these are my favourites because they are all different styles, but their level of intensity is the same. Being able to play songs of this intensity makes me remember why I became passionate about music - it was all about being intense back then". I guess I'd better leave the hay. It's time to punch the keys G'day! Hours merge into a day, writing code to pay the way"
This verse is describing how John feels about being a computer programmer, a job he has held down for 34 years. John says he has had no difficulty in balancing his music career with computer programming. John says "I'd love to become a musician full-time, but it's a fact that it doesn't pay as well or as often as programming". John promotes himself by appearing everywhere he can - art shows, busking, fetes and community fairs are all regular sites that John plays at to increase the public's knowledge of him and his musical talent. A lot of John's bookings come from people seeing him play at private functions and hiring him for their function. John's perception of his success is down-to-earth. He says he gauges his success from the number of bookings he receives and his ability to win new work. John finds it difficult to gauge his success from the number of CD's he sells because he says "there is no community support. The local FM radio stations provide support, as do the local newspapers, but the AM radio stations don't. The main thought from the community seems to be that if the music isn't played on commercial radio stations, it isn't any good and that's not true. It's a main source of frustration for me". The reason why John decided to release a CD was to display the songs that he was most proud of. His feeling was that the songs are written, why not record them and release them? As it stands now, John has achieved moderate sales concerning his CD. John was born in the year 1949 in the small community of Yallourn, which is situated in a close proximity of Moe and Morwell. John has always resided within the Latrobe Valley, formerly living in Morwell, but has now resided in Churchill for over 20 years. John's CD titled Eleven Bar Blues can be brought from independent music stores and by contacting John at P.O Box 857, Morwell, Vic or e-mailed at jmazur@netspace.net.au.